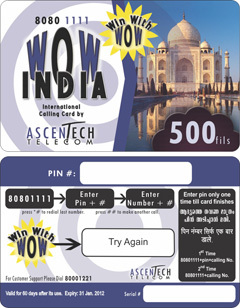 M-Tech Innovations has been one of the pioneers in introducing prepaid telephone cards in India. With coherent skills and expertise in this latest technology, the company has earned leading position among other Indian scratch cards manufacturers. M-Tech Innovations being one of the premium scratch cards manufacturers offers all types of paper and plastic cards in laminated and non laminated types for telecom/ loyalty applications. These telephone scratch cards are manufactured in Pune, India with indigenous technology using state-of-the-art machinery in highly secured environment. Our feature rich prepaid telephone cards are available with highest quality and optimum pricing. M-Tech Innovations being an ISO certified company is rated high and preferred among the scratch cards manufacturers in India. Talk to our executives regarding your specific need for prepaid telephone cards and we will offer you the most secured and good quality scratch cards. Prepaid telephone cards - used to charge the prepaid mobile phone accounts, play a vital role in everybody's life today. These prepaid telephone cards have a pin number covered with a scratch off patch that the customers will find out after scratching off that patch. The mobile account is recharged by calling the activation number and entering the pin given on the prepaid telephone cards.